The top crimper will give better results, however the bottom one works just fine too. Has anyone tried to crimp JST SH or ZH pins with these??? Not for JST-ZH connector pins! 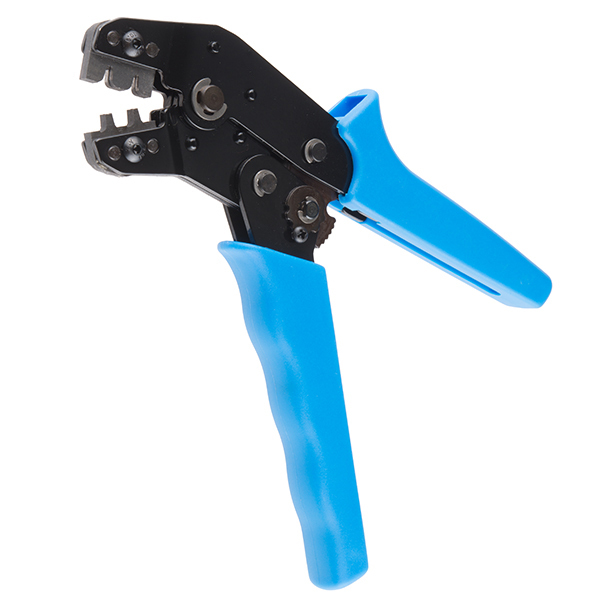 The ratchet action holds the connector securely while the wire is positioned. Then a quick squeeze and the crimp is complete. Great addition to your tool box! These appear to be decent quality crimping pliers, but they did not fit the type of pins I was hoping to use them with. I typically use 0.100 pitch housings for wire-to-board connectors, and the pin used with those housing is slightly longer than the typical JST pin. I took a gamble on it, but I'll still be able to use the tool with other projects. So sorry that these didn't work for your needs. They are good for crimping 0.25 - 1.5mm crimp pins and 28-20 AWG wires. Happy hacking! You must be willing to sacrifice a few terminals to determine which way the terminals need to be inserted to achieve the best crimp. I achieved the best crimp when the wings of the terminal would roll back into the wire. (Pointing upward in the plier image shown to the right). I used this tool with the molex SL series male and female pins great for Arduino and breadboard custom wire harness. (Digikey WM2517-ND and WM2510-ND) and matching 2pos and 3pos housing (Digikey WM2800-ND and WM2801-ND) the housing state they are female but you can insert male pins in the other direction and it works great. I hope that sparkfun will carry these parts in the future. Along with the 22awg stranded hookup wire (11375) it is all you will ever need and you can throw all your jumpers away. These are the second pair of crimping pliers I've tried for making .1" harnesses for my prototypes. The first pair were cheap and didn't work. I ordered pins for these based off another review and found that these pliars crimp very consistently, though, the jaws seem to be just a hair too narrow, and always miss part of the crimp. I just crimp twice and my connectors come out right every time and fit just right in the shrouds I ordered with the pins. Unlike the cheap pair I own, which deform the pins so they don't fit in the shrouds. If there's pins on digikey that fit these jaws perfectly, I haven't found them, otherwise I would give 5 stars. These are well made. The dies seem to be precise enough to get the job done and the ratchet mechanism works perfectly. I'm trying to crimp the pins for the special connector for the dust sensor. These pins are tiny, so it's very difficult to get them positioned exactly right. (Buy lots of extra pins and take your time and expect to mess up a few.) I suspect larger pins are a bit easier to maneuver into place. I wish the tool had come with a good set of instructions or that the Sparkfun site had a good video showing the proper technique. I stumbled upon a tutorial on a competitor's site, and now I have a slightly better idea of how to do it, but it's still tricky. I also wish the tool had something to hold the pin and wire in place as you ratchet it closed. It's very easy for something to shift a little out of place which spoils the crimp. Perhaps a bench-mounted version would free up a hand to help keep everything in alignment. 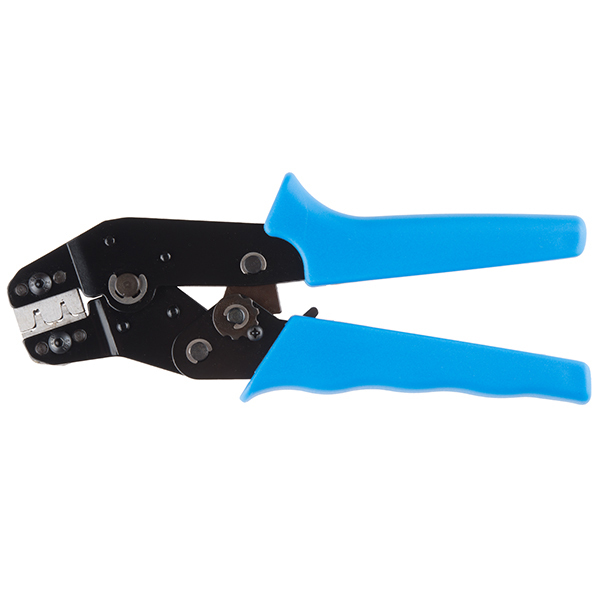 I replaced my old crimping pliers with these because I was worried that I might have repetitive stress injuries from crimping too tightly. These pliers are a breeze to use. 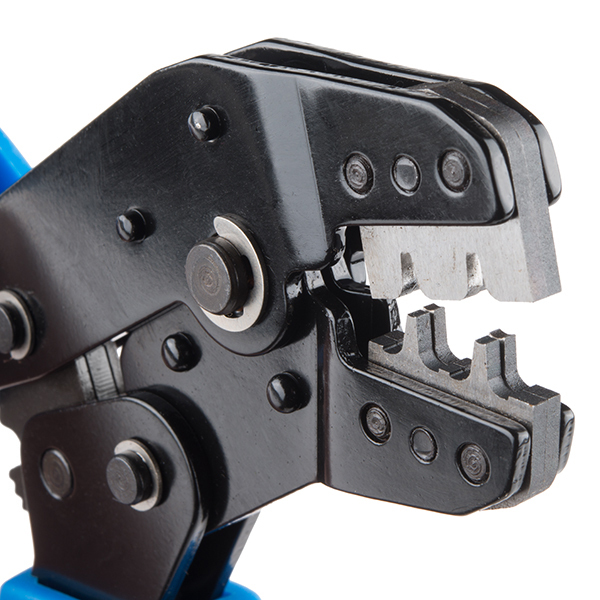 I use a variety of different connectors, and manufacturers like Molex or TE charge quite a bit for the crimpers they design to fit each specific family of pin. This crimper does not fit pins perfectly, but the quality of the mechanism and the die that comes with it is a great value. Much better than spending $150-400 for each different style of connector. I bought these to use with some small crimps that came with my RepRapPro Mendel Mono printer kit. I was initially concerned they wouldn't be the correct size but that turned out not to be the case. They worked flawlessly and they seem quite well built so I suspect they'll last for a while. The only thing I didn't like was how expensive they were but sometimes you just need the right tool for the job. I'm using these to crimp 0.1" headers and smaller JST headers as well. So far, the 0.1" come out just about perfect. The strain relief just needs a little extra tweak. Every connection has been solid so far, have done about 30.